Let’s explore the world of racing fashion. I’ll show you how to create your perfect race day outfit so you can look great at your next race event. To get started, scroll down the page to see the resources that will help you on your way. 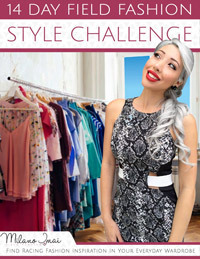 Grab the style challenge and practice racing fashion in your everyday life using your existing wardrobe. Download the trends report so you know what styles, shapes and colours are trending. 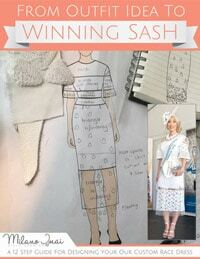 Read this 12 step guide to learn how to turn an outfit idea into a competition winning design. Finally, a place dedicated to helping you find racewear. If you’re anything like me, you’ll know the frustration of searching through 200+ pages of dresses only to find a handful that are racewear appropriate. When you’re starting out, it can be tricky knowing what’s suitable or where to look. So to help you find the perfect outfit, each week I scour the web and hand select racewear items that I think you’ll love. Have fun searching my collection using tags that are designed with the racing fashion enthusiast in mind… tags like fishtail, or feature sleeves, or print clash! Having some race friends who enjoy the mayhem and exhilaration of FOTF is a must. I started the Field Fashion Community Facebook Group over a year ago now to help ladies connect with other like minded women. Since then, it’s grown to become one of the largest and most active racing fashion groups on Facebook. It’s a place where women ask for outfit advice, show photos of their recent wins, share racing fashion related news and notify others about store sales. We have our own group fashion competitions and even have in person meet-ups! I share all my best tips and tricks to help you look and feel fabulous at your next race day. New blog post every other Thursday. 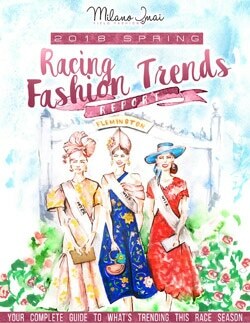 As you can see, I’ve created plenty of free resources on this blog to help you get started in the world of racing fashion. If you’re looking for a little extra support with getting started or planning your next race day outfit, I also offer 30 minute 1‑on‑1 style sessions where we can chat about whatever you are working on or need help with. The Night Before 2019 Weetwood FOTF | No Outfit, No Time, No Problem! Classic vs Contemporary Racewear | Which Category should you Enter? Insider fashion tips, outfit ideas & more! Find out what styles, shapes and colours are trending this year. Enter your name and email to get the trends report. Plus, you'll receive exclusive weekly fashion tips to help you stand out at your next race event. Do the style challenge and practice racing fashion in your everyday life. Enter your name and email to receive the challenge guide. Plus, you'll receive exclusive weekly fashion tips to help you stand out at your next race event. Learn how to turn an outfit idea into a competition winning design. Enter your name and email to get this 12 step guide. Plus, you'll receive exclusive fashion tips to help you stand out at your next race event.